On Saturday, June 30th, Hubbell & Hudson is hosting its 3rd annual Beer & Cheese Festival. The Beer & Cheese festival is a great way for Houstonians to become acquainted with new and unique pairings of different styled beers and cheeses. 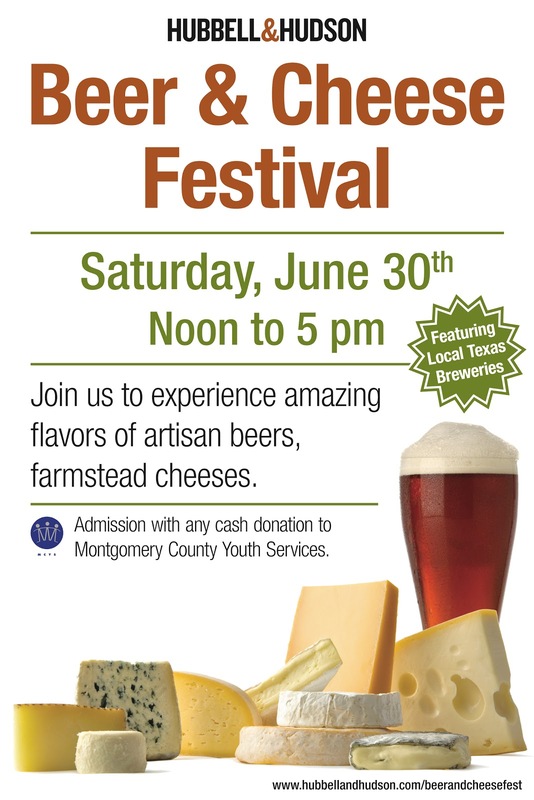 Throughout the event, beer and cheese experts will be available to answer questions. Featured local Texas Breweries include Rhar & Sons (Fort Worth, Texas), St. Arnold (Houston, Texas), Karbach (Houston, Texas), Independence (Austin, Texas) and Southern Star (Conroe, Texas). The event takes place in the store located at 24 Waterway Avenue in The Woodlands from Noon to 5:00pm and admissions is granted with any cash donation to Montgomery County Youth Services. I attended the Beer & Chesse Festival last year and although it got a pretty crowded in the store, it was still a good event that helped promote craft beer and demonstrate its versatility. If you're going to be up The Woodlands, I definitely suggest checking it out.